Our OpKey Execution Agent is a functional test execution engine which helps you to execute your test script. OpKey Execution is required to perform test execution with all editions of OpKey. After installing OpKey Execution Agent on your machine, review all configurations to ensure compatibility. OpKey Execution Agent is available independently of OpKey and required for test automation. 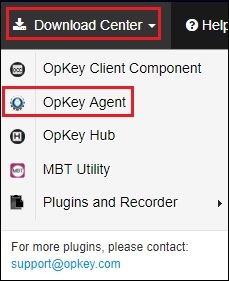 Users are able to download OpKey Execution Agent at no additional cost from the Download Center located on the top left of the OpKey Dashboard. Installation of the OpKey Execution Agent is very easy. You just need to follow few standard steps of installation. Before installing OpKey Execution Agent from Download Center, you must be informed that it will replace your existing Execution Agent, if any is installed on your machine. You can execute your Test Scripts on OpKey-Desktop as well as OpKey-Web by using the same execution agent, just by applying required configuration settings. Installing OpKey Execution Agent is very easy. Double click the downloaded setup file and follow installation steps. Click on Next to initiate the Agent installation process. Here, you can read End User License Agreement. Check “I accept the terms of the License Agreement” checkbox and click on Next. 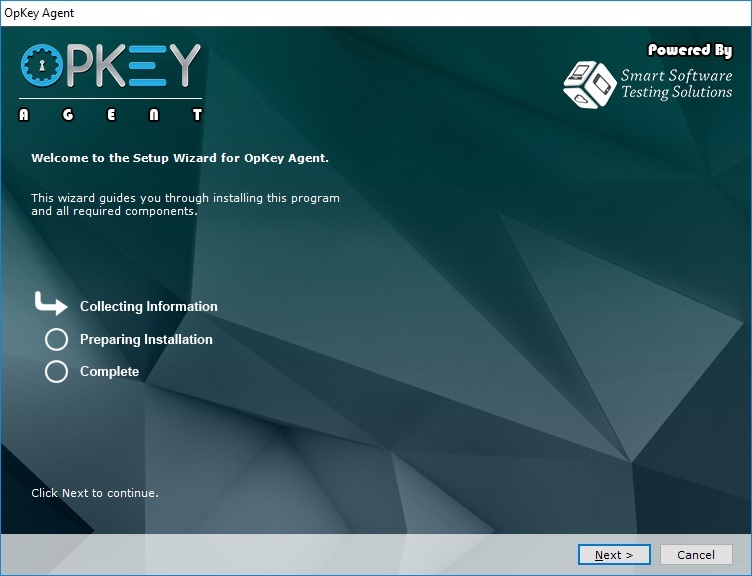 You can customize installation of OpKey Execution Agent features during installation. If you want to install full version of OpKey Execution Agent then select ‘Full‘ and select ‘Custom‘ if you want to customize it. Click on ‘Next‘ to proceed. In this step, OpKey Execution Agent calculate the available, required & remaining space on your machine. Click on ‘Next‘ to proceed. From here, you can customize usage of this OpKey Execution Agent being installed on your machine for All users of this computer or Just me. If you select All users of this computer then it will be accessible to all users working on this computer whereas if you select ‘Just me’ then it will be accessible only to the current user of this computer. You can check Create Installation Logs to view installation logs on completion of Agent installation. Click on Next to proceed. In this step, Agent installation is being prepared. Click Next to proceed. Here, you need to enter the Agent Authentication Code. Authentication Code (a unique alphanumeric key) available on the Agent Information page under Download Center. This authentication code is required to connect OpKey domain with agent so that connection of local machine can be done with OpKey’s cloud server. If you want to install Agent without entering Authentication code, mark Continue without Authentication code checkbox and click on Next. 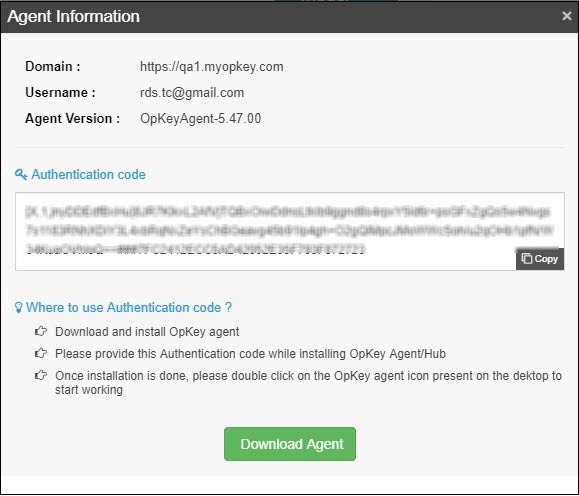 Now, there is a authentication code (an unique alphanumeric) for OpKey Agent which is available on the Download Agent page under Download Center. This authentication code is required during installation of OpKey Execution Agent in Web Mode (by default), you will need to enter this Agent authentication code to specified text field and click on Finish. Once installation has finished successfully, a shortcut icon of OpKey Agent is created on the desktop. Double click this shortcut icon to launch the OpKey Agent. Here, you can view that your OpKey Agent is configured successfully in Web Mode and you are logged in. Thus, you need not to configure the OpKey Agent manually. OpKey Execution Agent installation behavior have been improved. Now, there will be only four default plugins (OpKey_Utility, OpKey Desktop, IE-Plugin, Selenium-JS, and Utility) installed with the OpKey Agent. They are most commonly used plugins for executing tests with OpKey. Earlier to this, all the supporting plugins were getting installed with the OpKey Agent. All the installed plugins were not frequently used plugins and size of the Agent installer was a bit big which was taking more time to install them. You should have admin privileges for installing OpKey Agent in the default location (C drive of local machine). As a Non-Admin user, you can install it to a different location (any other drive of local machine which requires no admin privileges). 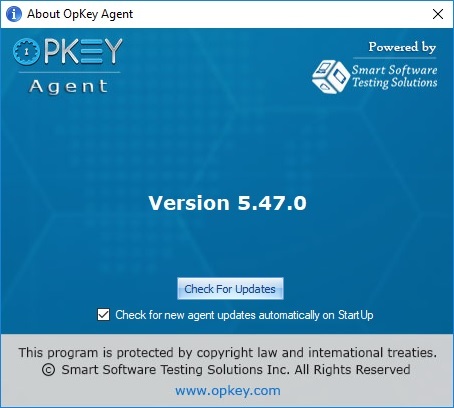 Once OpKey Agent has installed successfully, you can execute your test scripts by using the default plugins or additional plugins (if you have installed) on OpKey Desktop and Web by switching OpKey Agent to OpKey Desktop & Web mode respectively. If you need to install additional supported plugins then you need to install it externally. Once the new plugin has installed successfully, you can view a new folder with the same plugin name under AgentData folder as described above. You need to relaunch your OpKey Execution Agent to reflect the changes regarding the newly installed plugin. You can also view installed plugins displaying under the Plugin Manager in the OpKey Agent Tools menu. Click on the Plugin Manager option displaying under the Tools menu in OpKey Execution Agent. When you click on Check For Updates link given under the About OpKey Execution Agent option in the Help menu, it starts checking for the available updates of the OpKey Agent. If you want to install those updates, click on Yes & proceed. If you don’t want to update your OpKey Agent, click on No. After clicking on Yes, it starts downloading the available updates. Once downloading of Agent updates has completed, it prompts a message that “Do you want to allow this app to make changes to your device?” Click on Yes to install the plugin. Follow general instructions to install the plugin. Once installation of a plugin is completed, a message of installation of next plugin appears. Similarly, follow the general instructions to install the plugin. Thus, you need to follow the general instructions to install download updates of the OpKey Agent one by one. Once all the updates have been installed successfully, a message appears that Plugin(s) have been updated successfully. Changes will be applied after Agent restarts. Click on OK. If the updates are available for many plugins then you are asked to install updates of the installed plugins one by one. By default, plugins are installed at the same location where OpKey Agent is installed. User has no option to install the plugin update to a different location, other than the installed Agent location. If updates are not available for the installed plugins, it displays a message that OpKey Agent is Up to Date. If Check for new agent updates automatically on StartUp checkbox is checked then Agent will check for the available updates for the installed plugins as well as any other changes to the Agent. If it is not checked then you need to click on Check For Updates link manually to look for the available updates regarding your OpKey Agent. Admin & Non-Admin users can use default plugins to execute their test scripts but such plugins cannot be uninstalled by any user. If OpKey Agent is installed by an Admin User then updates of these default plugins will be visible to all users (Admin & Non-Admin) but they can only be installed by the Admin users. 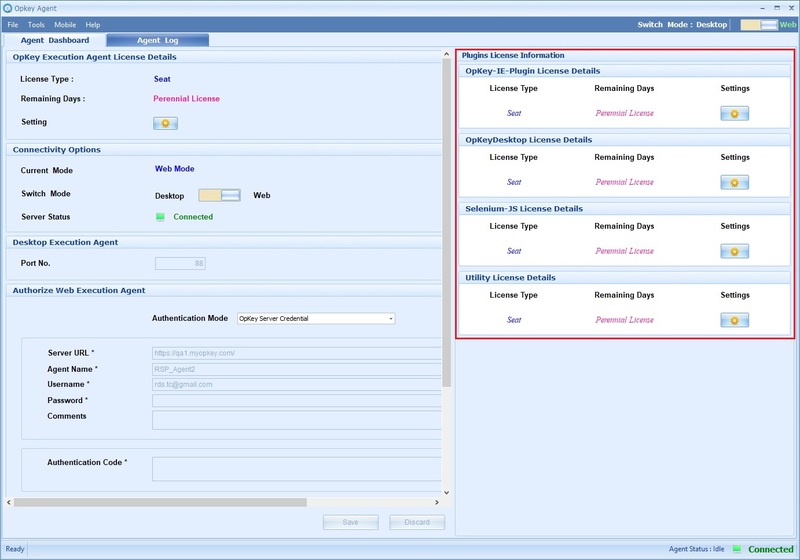 If Agent has been installed by an Admin user (to be used by all users) and additional plugins have also been installed by an Admin user then they can only be uninstalled by the an Admin user. However, these plugins can be used by all users (Admin & Non-Admin) for executing their test script. If Agent has been installed by an Admin user (to be used by all users) & updates of additional installed plugins are available then updates will be visible to all users (Admin & Non-Admin) but updates of such additional plugins can only be installed by the admin users. If OpKey Agent has been installed by a Non-Admin user on a local machine drive (which needs no admin rights) then additional plugins can be easily installed by the Non-admin users. In this case, this Agent can only be used by that Non-Admin user who has installed it. It will not be visible to any other user. After installing an external Plugins), you need to relaunch the OpKey Agent (go to the File menu and click on Relaunch) to reflect the applied changes.